The soothing Liquid Shard sculpture at Los Angeles’ Pershing Square mesmerizes passers-by as it moves in harmony with the wind. 3 Rivers Helps Enable Technological Innovation! 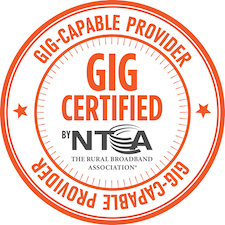 3 Rivers Communications has been recognized by NTCA–The Rural Broadband Association, as a Certified Gig-Capable Provider for delivering gigabit broadband speeds and enabling technological innovation. NTCA represents nearly 900 independent, community-based telecommunications companies that are leading innovation in rural and small-town America. Providers like 3 Rivers face unique and challenging circumstances every day serving some the country's most rural and remote communities. "By building a gigabit-capable network, 3 Rivers has not only overcome these challenges, but also shattered conventional benchmarks for broadband speed to enable cutting-edge technologies that drive innovation and promote economic development in their communities, region and nationwide," said NTCA Chief Executive Officer Shirley Bloomfield. To achieve certification, 3 Rivers has shown that gigabit technology is commercially available within 95% of one or more exchanges it serves, among other requirements. More information about the NTCA Gig-Capable Provider certification program is available at www.ntca.org/gigcertified. If you love sports, you'll love this ESPN app. Use it to stream live events, watch clips, see game scores, and get updates on other sports news. ready.gov – September is National Preparedness Month, and you can use this site to become informed about potential disasters in your area, how to get emergency alerts, and where to go in case you need to evacuate. The site addresses a wide range of potential threats including drought, earthquakes, extreme heat, home fires, and hurricanes. hgtv.com – A new school year is a great time to get organized. Use these easy, inexpensive tips to corral school supplies, school information, files, and much more. The projects use common items like storage bags, duct tape, wrapping paper, cereal boxes, spice holders, and soap dishes. renocompare.com – Get innovative ideas for remodeling your kitchen, bathroom, basement, master bedroom, yard, or any other area of your home. Use the search function or handy index to look for your next project, and sign up for the newsletter to get remodeling info delivered right to your inbox. booking.com – It's not too early to start planning your holiday travels. This site can help you find flights, cars, accommodations, or combination packages. Check out the "Find Deals" section for the lowest prices, or the "Travel Guides" area for things to do, the best time to visit, and traveler reviews. Short Tutorial/FAQ – Why Does Restarting My Computer Fix Many Problems?